Can you make beer cheaper than you can buy it? The answer is a definite maybe not. 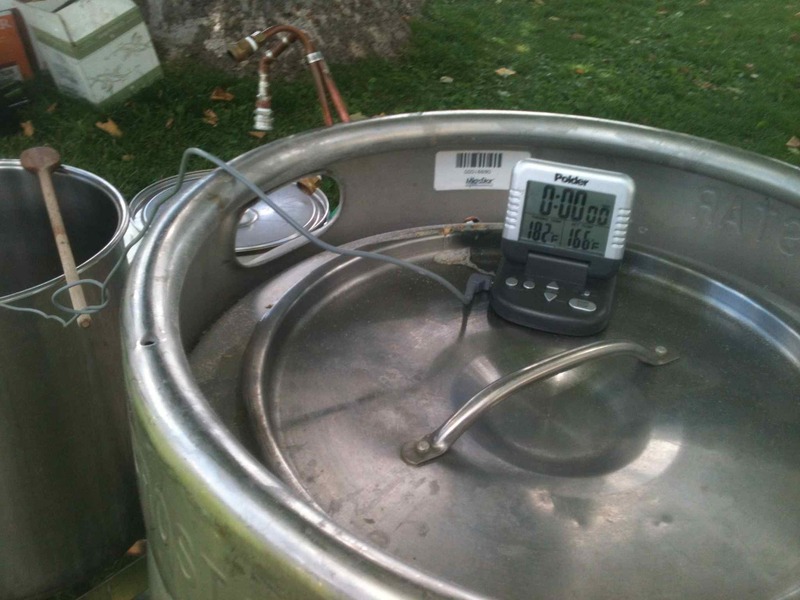 You may be able to brew your own beer cheaper than you can buy it at the supermarket unless we are talking a Bud/Miller/Coors product, and then only if you never make a mistake and have a bad batch (they do happen, even to the big guys), don’t include your labor time, or the equipment. I just brewed a batch of a New Albion pale ale clone. If you’re not familiar with New Albion, it was the craft beer brewed by a micro-brewery (in the days when Anchor Brewery was considered a small brewery), the year was 1976. (I will write more about New Albion’s history in another post.) The recipe is simple with no specialty ingredients needed. It is base malt plus a small amount of hops, and water and yeast. The simplicity lowers the ingredients cost and the time. My calculations (below) show that I can brew a New Albion clone for $0.127 per ounce versus buying one from the supermarket for about $0.136. Or put another way, a bottle of my clone costs $1.52, which is 11 cents cheaper than a store bought version. 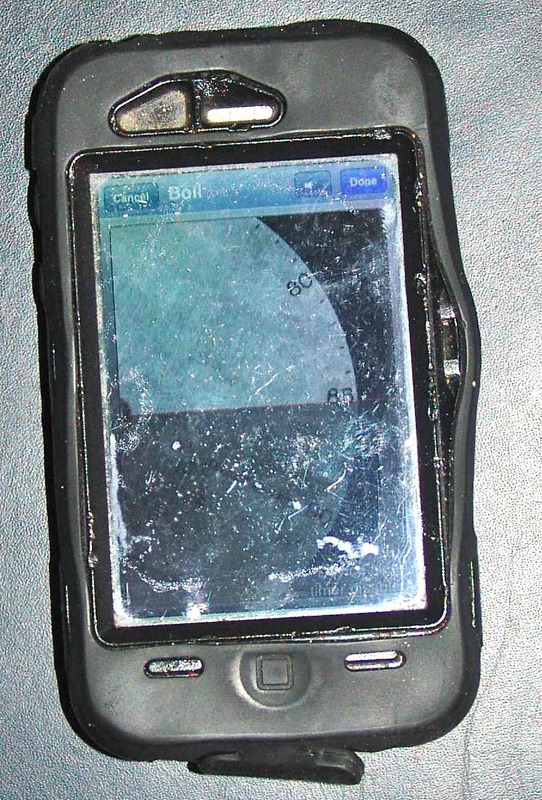 My calculations include the cost of bottles and labor (at minimum wage). Now, you can argue that you won’t need to buy bottles every single time (and you would be right). You might not even have to buy bottles at all and have them donated to you by friends. If you go the used bottle route, there is still a cost, the cleaning and sanitizing will take time and materials to get them ready to fill. You might not want to include your labor, but it needs to be included (even if it’s only at minimum wage rates) because it is what economists call the “opportunity cost.” Your time is not worthless. Instead of brewing beer you could be doing something else, perhaps earning money at the minimum wage. I used four hours for the time needed to set up, mash, sparge, boil, cool, transfer to fermenter, and clean up afterward (which may be a little tight). My time for all of that is around the six hour mark, which would mean that it is cheaper for me to buy my beer than to make it (by $0.17 per bottle). I am paying for the privilege and fun of the brewing day. 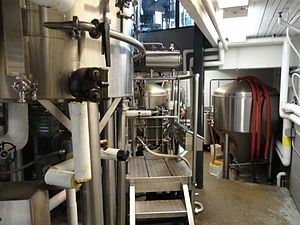 The cost of equipment type stuff, boil kettles, mash tuns, etc., has been ignored; though when you throw that in it certainly tips the scales in favor of the buying of commercial beers. 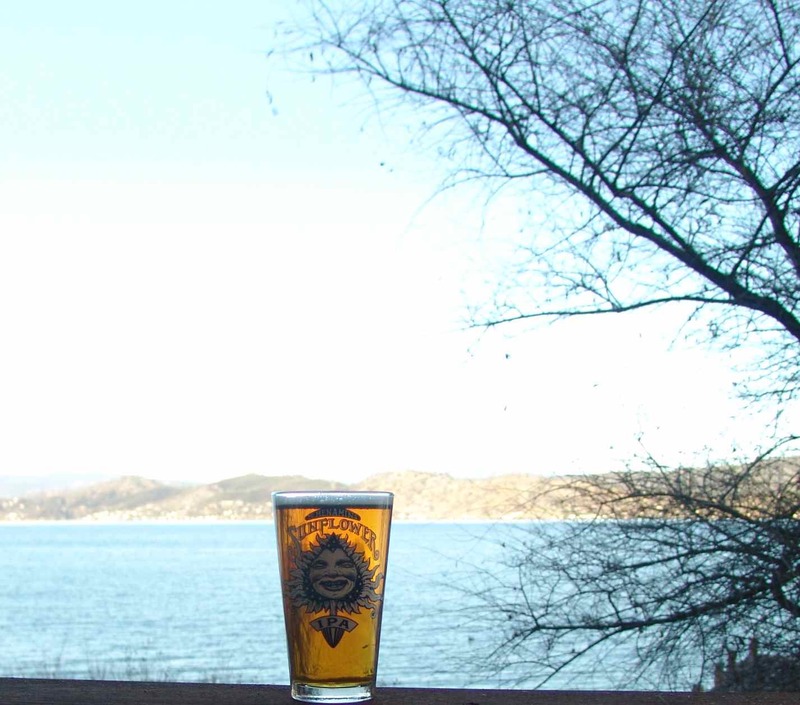 Live in Lake County, Calif and make or want to learn how to make your own beer? Join us. 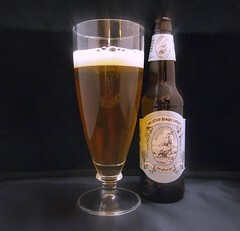 Our next scheduled Lake County Homebrew Club (visit our Facebook page here) meeting is set for Monday May 21, 2012 at 6 PM at at Guido’s Pizza in Kelseyville. Among other things, we will talk about the Big Brew we had on May 5, the upcoming Lake County Winemakers Fest, taste and evaluate each others beers, and we will be tasting spices, fruits, and whatever we might want to try to steep in beers using French presses. Bring a glass (wineglasses work well) for tasting, and (if you are a homebrewer) bring some of your homebrew to share. Live in Lake County and want to learn how to make your own beer? We can help. 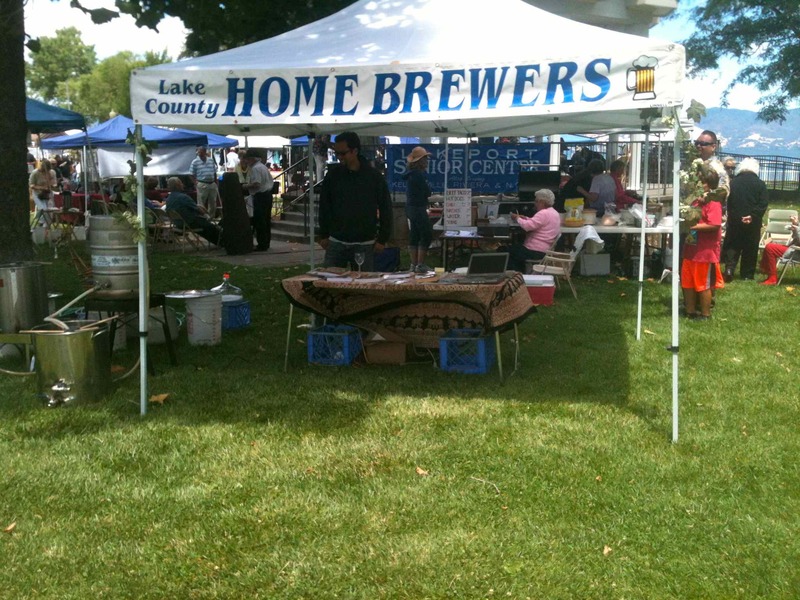 Our next scheduled Lake County Homebrew Club (visit our Facebook page here) meeting is set for Monday April 23rd, 2012 at 6 PM at at Guido’s Pizza in Kelseyville. For the Big Brew on National Homebrew Day (Saturday, May 5, 2012) the tentative plan is to brew a New Holland Dragon’s Milk clone and hopefully procure a 55-60 gallon bourbon barrel to age it in although this is not set in stone. Leave a comment if you have other ideas. 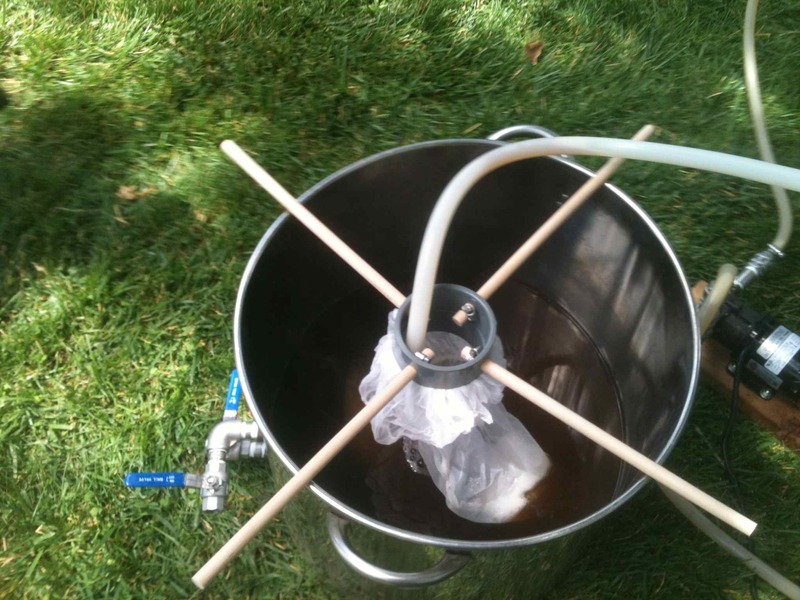 And, leave a comment if you are interested in brewing at Big Brew Day, and whether you want to brew 5 or 10 gallons. We may have extra equipment for mashing. Anyone out there with a 55-60 gallon bourbon barrel that will loan it (for 6 months) or sell it for a song? Let me know in the comments. 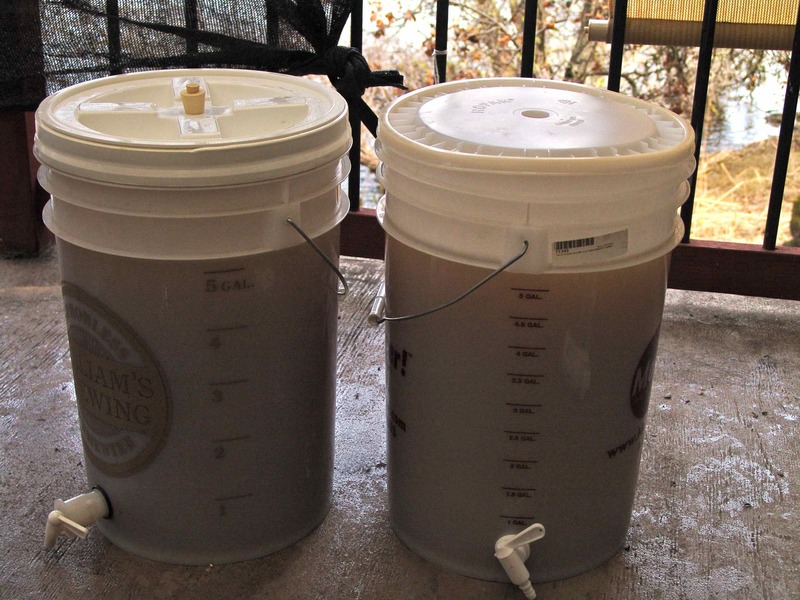 This Week on Brew Disasters: Cloning Lagunitas Brewing’s Little Sumpin’ Sumpin’ Ale. 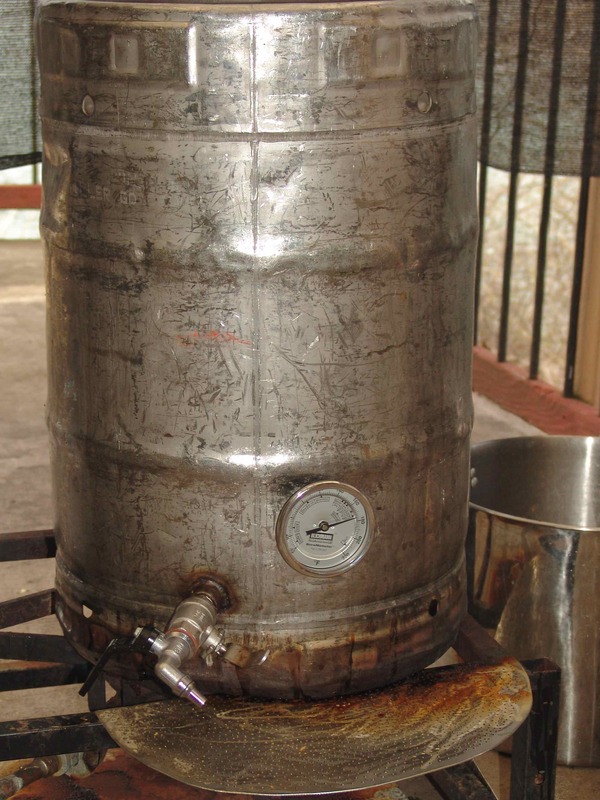 Note: a pictorial of the brewing process is toward the end of this post. We here at Flog-This-Dead Brewing are excited to try brewing a new (to us anyway) beer: Lagunitas Brewing’s Little Sumpin’ Sumpin’ Ale. 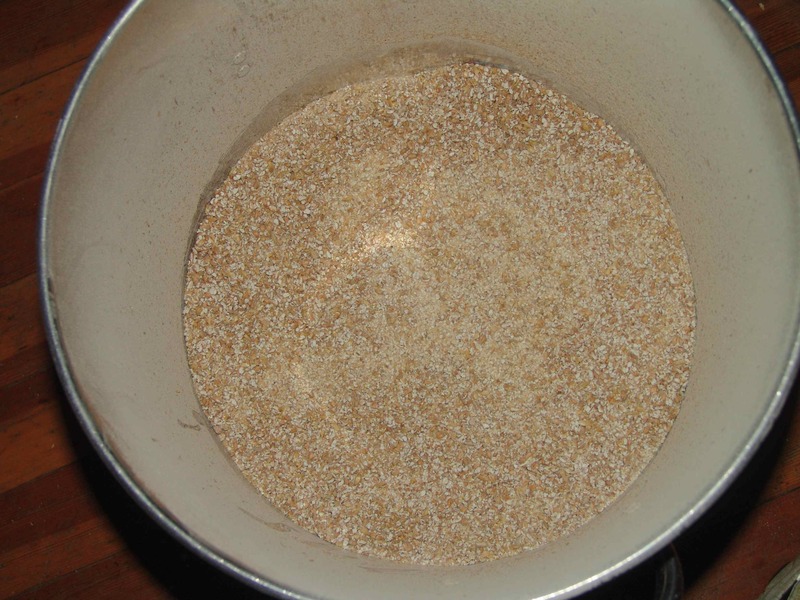 The grain bill is 16 pounds; a 50/50 blend of wheat and barley. The beer has minimal brewing hops and, true to the Lagunita’s way, massive dry hopping, 4.5 ounces for a 5 gallon batch. A huge thank you to the Jamil Zainasheff and Mike “Tasty” McDole of the Brewing Network‘s Can You Brew It and Lagunitas Brewing Company for sharing their Little Sumpin’ Sumpin’ Ale recipe with them. And, lastly, thanks to my buddy Paul for pointing me to the recipe and my loving wife for helping at just the right times. 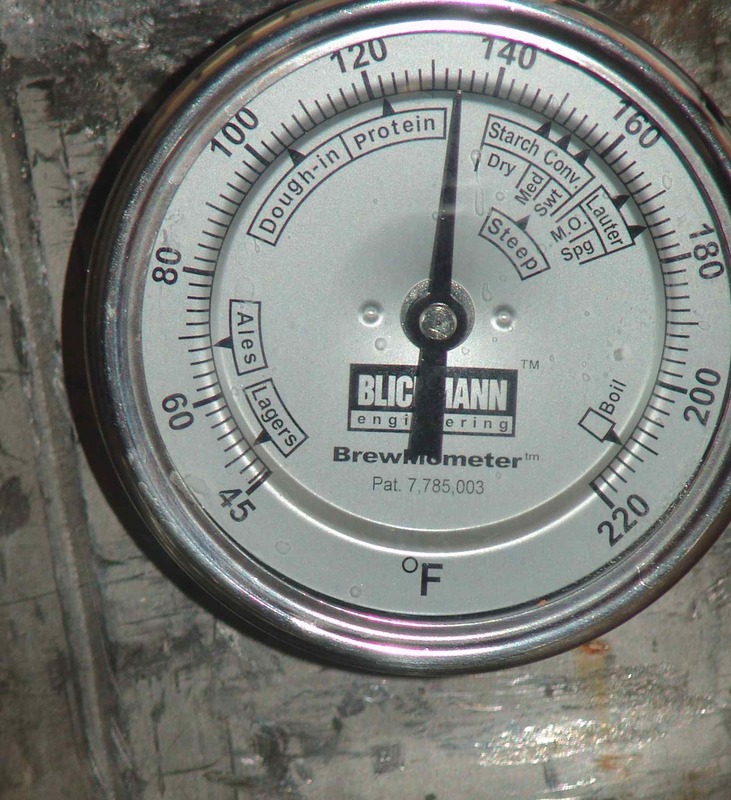 As you may recall, we here at Flog-This-Dead Brewing just supplemented our temperature monitoring from a handheld Taylor 9842 Commercial Waterproof Digital Thermometer to a BrewMometer by Blichmann Engineering. So we started the strike water temperature for our mash at 20F above our desired mash temp, because we had found that after adding our grain the water cooled 20F. Apparently, having a thermometer probe further down makes a big difference and the mash temperature did not drop the 20F expected. Yikes, instead of a desired mash temp of 150, the mash temp was 170F! We yanked the bag of grain out of the mash tun and began cooling the watery wort down. 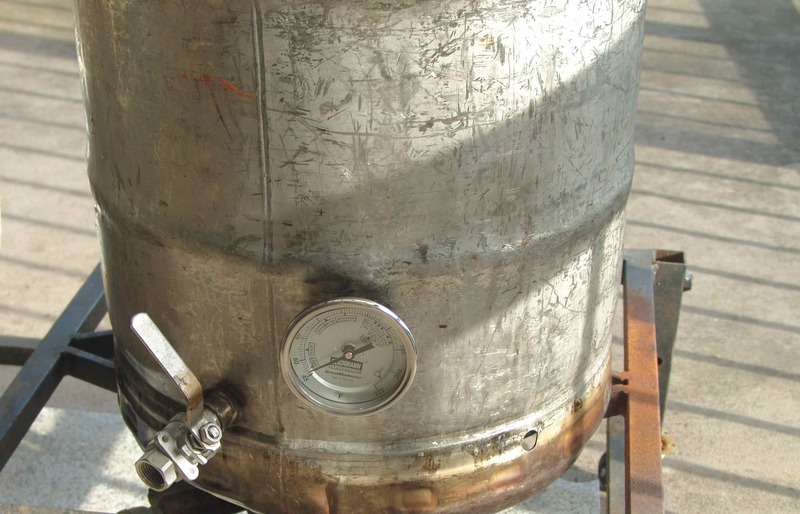 After cooling the mash conversion process started at a temperature of 149.5 and after 60 minutes finished at 137F. A batch sparge was used and the total wort produced was 10.5 gallons with a pre-boil specific gravity of 1.043 (1.033 @ 117F); a full 12 points below the 1.055 that was the target, the addition gallon produced had a lot to do with that (You would think I could subtract 9 from the yield of the first runnings, but no, I muffed it). 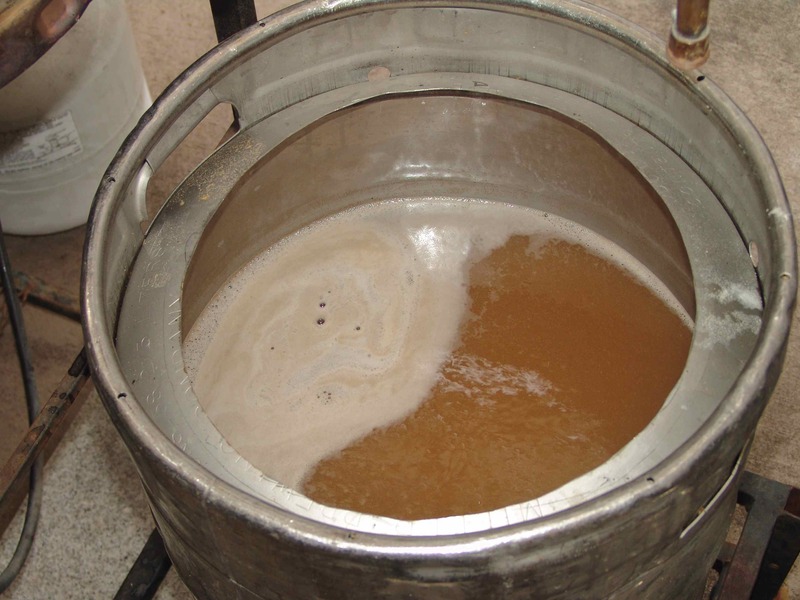 One-half pound of corn sugar and one-half pound of dry malt extract were added to boost the specific gravity. It took over about an hour and a half to get the wort to boiling for the 90 minute boil. Total time for brewing day (including cleanup–that’s why it’s a hobby and not a business): 12 hours. Overall impression: Good start. Slightly maltier than hoppy. The Flog This Mule mill. 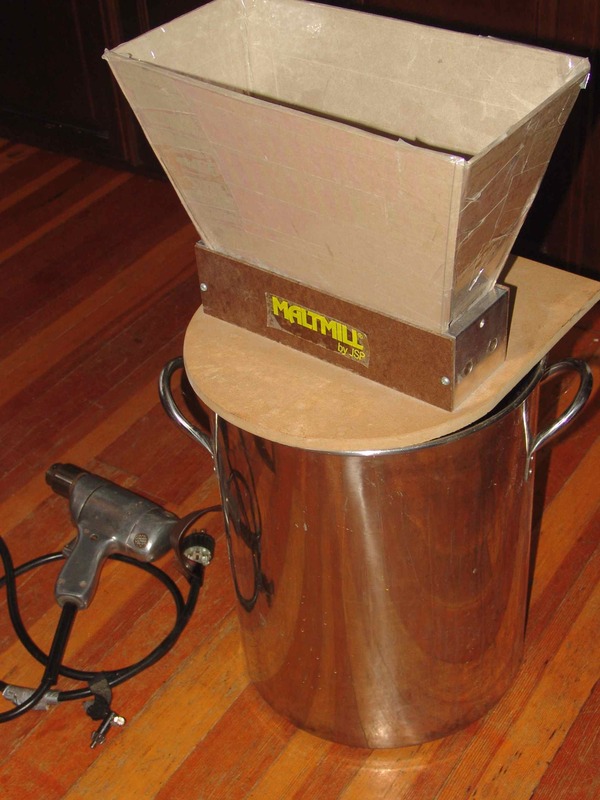 The hopper was fashioned from book cardboard and contact paper. A world war II vintage drill form Douglas Aircraft surplus supplies the power. 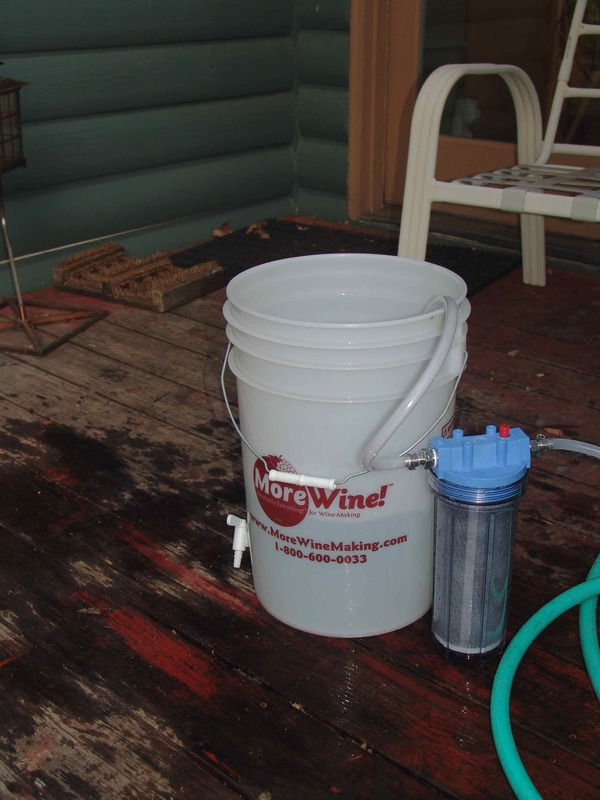 Filtering water to remove chlorine. 149.5F at start of mash. After our initial goof of 170F! 137F a the end of 60 minutes for first mash. Output of ~10.5 gallons of wort from the mash. 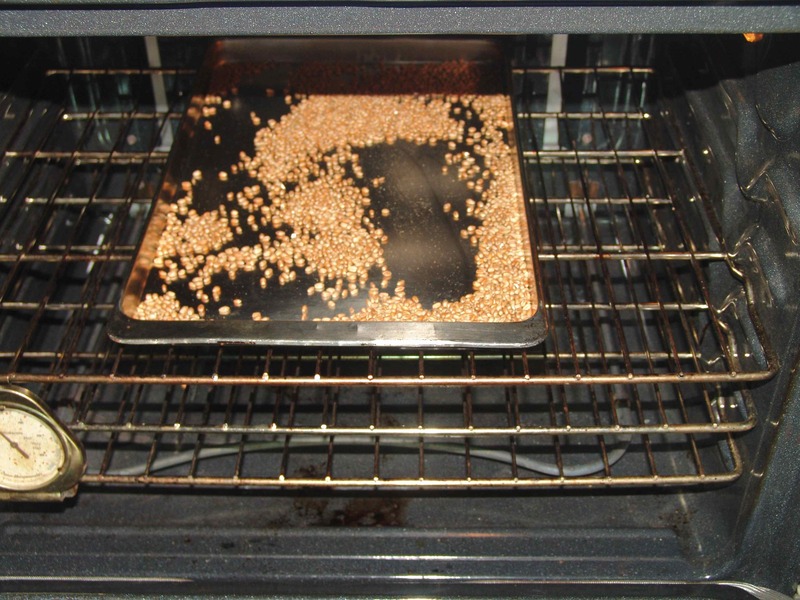 How on earth did I batch sparge 1.5 gallons too much? Subtract the desired amount (9 gallons) from the first runnings and that’s the amount of hot liquor (aka hot water) to put in for the second. 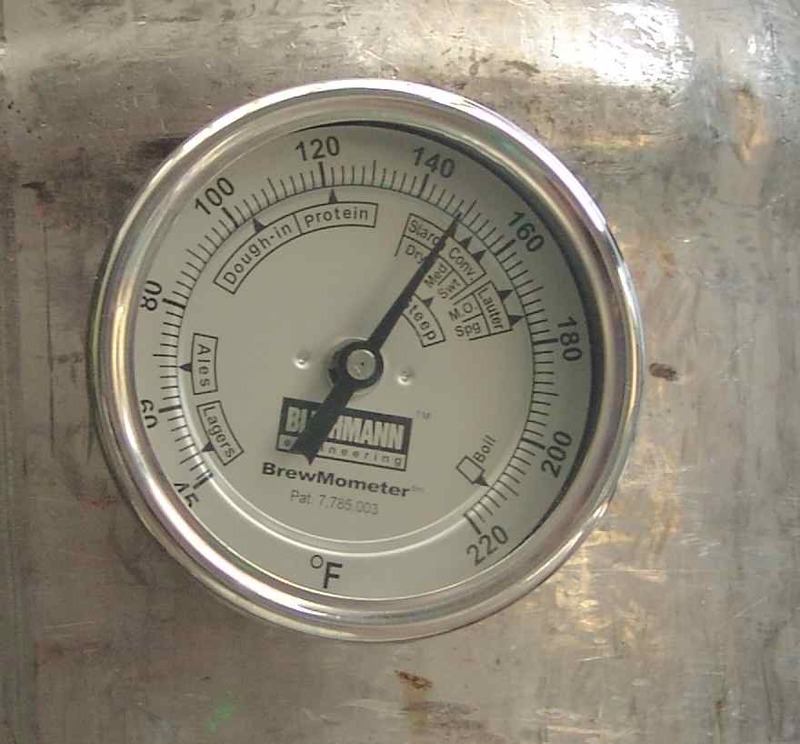 A piece of metal is placed below the thermometer to shield it from convective heat. Wort beginning to boil. The foam in the kettle contains proteins (?) that many say to skim. I skim the foam. BrewPal app has a nice brewing timer. Enter your recipe into BrewPal and it reminds you when to add hops, other additions such as Irish moss, and the wort chiller.